For a long time, the results of playing a discard card against a draw card were strange: the draw effects were applied first, then the discard effects, then the hand would be discarded down to the 6 card limit. This meant that if you played a discard 2 against an opponent playing a draw 2 effect with 6 cards they would end up with 6 cards: a strange result, shouldn’t that be 4 cards? In Combat Cards 2.1 it is. Now draws are applied, then the hand is discarded down to 6 cards, then discards are applied. This means that if you play a discard attack against an opponent with 6 cards they will always end up with less than 6 cards, which makes sense (and also makes discard attacks slightly more powerful). Unfortunately by making discards more powerful, Renaissance became much less powerful. It draws up to 3 cards and discards 3. With the new rules this means that if you play Renaissance with 6 cards in your hand, you now end up with 3 cards, not 6, a big change. To remedy this I’ve changed Renaissance to draw up to 3 cards and discard 2. This means if you play it with 6 cards in your hand you end up with 4, but if you play it with 3 cards in your hand you can also end up with 4. It becomes less powerful as you hold more cards, which is a nice mechanic. Most of it anyway, swing by the UK shop to see if our plucky posty can make it to your country. I’m planning to set the automatic updater to send out final 2.0 versions of all of the Combat Cards arenas and bots tomorrow. If you have customised an arena, please make sure you have a copy of the arena and your custom settings file saved in your inventory. After the upgrade is complete you should be able to copy the contents of your new 2.0 arena in to your custom arena and replace the settings with your saved custom settings. 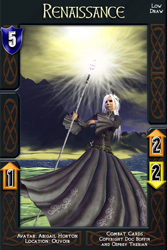 A couple of weeks ago, Joh pointed out that the Second Life version of Combat Cards didn’t allow cards requiring a single point of energy to be played when you have 2 points of energy available. I hadn’t thought about this – the switch from groups to resources was supposed to just make the real life game easier to play, not change the game in any way. The reason the Second Life version didn’t allow the play was that behind the scenes it runs the same group conditions code that it did in 1.5, but sure enough, the way the real life rules are written, what Joh was describing should be legal. I quickly hacked in some code to make it possible in the Second Life version and Mich and I tried it out: with disasterous results. If you can play a card requiring one resource when you have 2 available, you can sit 1 turn away from finishing a 3 turn combo indefinitely, which makes it impossible for your opponent to anticipate when the combo will end and makes 3 turn attacks much more powerful, unbalancing the game. 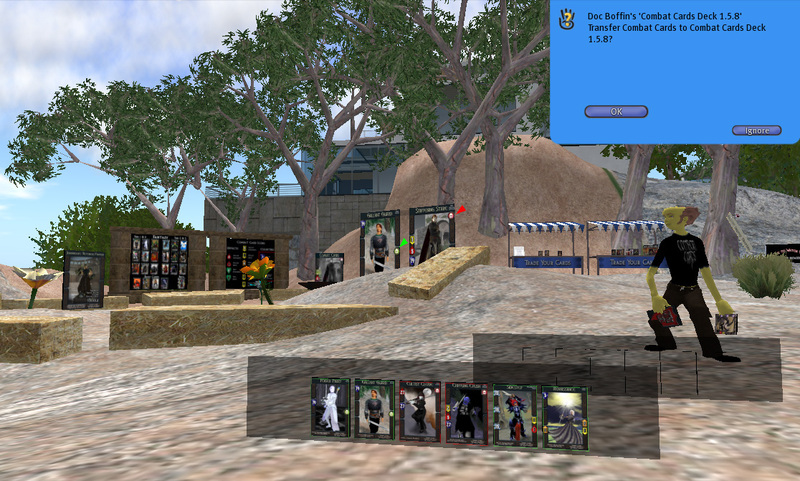 So, instead of adjusting the Second Life game to match the real life rules, I’ve instead tweaked the real life instructions to match the old behaviour: if a card has a consume resources condition you must have exactly that number of resources available, no more no less. A nice side effect is that we can add a version of consume resources as Joh imagined it working to new cards in the future. The updated rules can be freely downloaded in the print and play version of combat cards here. Here’s the (hopefully final) version of the PDF instructions that will ship with the real life cards in the very near future. Let me know if there are any final changes that need to be made.